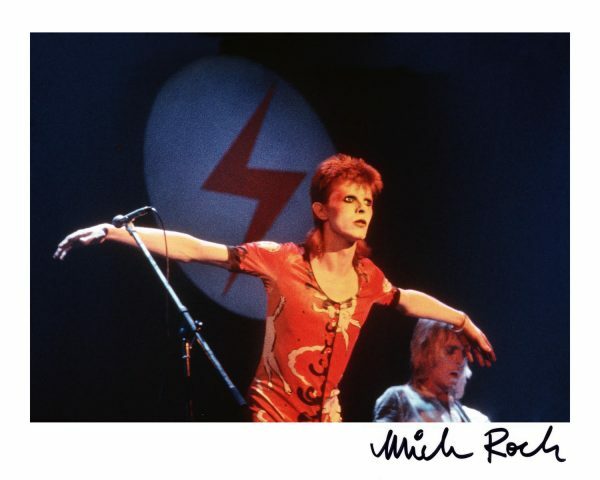 For the first time ever, iconic rock photographer Mick Rock has made available an extremely limited edition, hand-signed print exclusively on MickRock.com. He has personally hand-picked this iconic image of David Bowie from his timeless collection of photos. This unique photograph of Bowie, Titled “Bowie Flying High, UK 1973”, will be only available thru MickRock.com for the holidays. Be the first to own this extraordinary piece at an exceptional price for every David Bowie and Mick Rock fan alike. A perfect gift for the holidays! David Bowie released his genre-defining classic album The Rise and Fall of Ziggy Stardust and the Spiders from Mars in June 1972. It was during this period that Bowie created the character Ziggy Stardust, who would become the template for countless acts over the next 40 years.